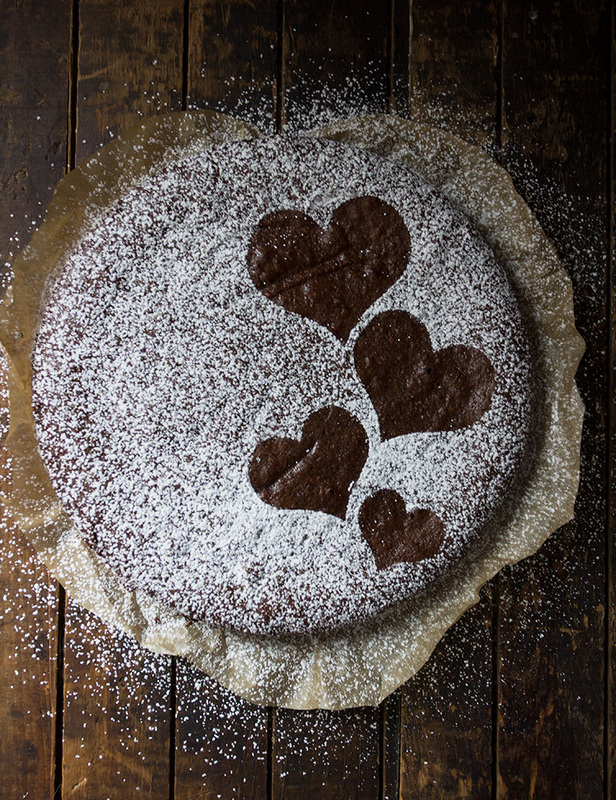 Delicious, decadent warm, Swedish Gooey Chocolate Cake, dressed up for Valentine’s, that just happens to use basic pantry items and is ready to eat in less than 30 minutes! This chocolate cake has been on my “to make” list ever since I spotted it almost a year ago on Saveur’s 100 Things to make in 2016. For one reason or another, I just never got around to it. 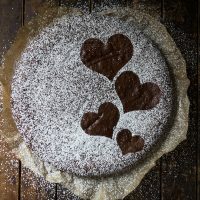 So when I was asked if I’d like to make a Valentine’s treat to share with a group of other food bloggers, I immediately thought of this cake. 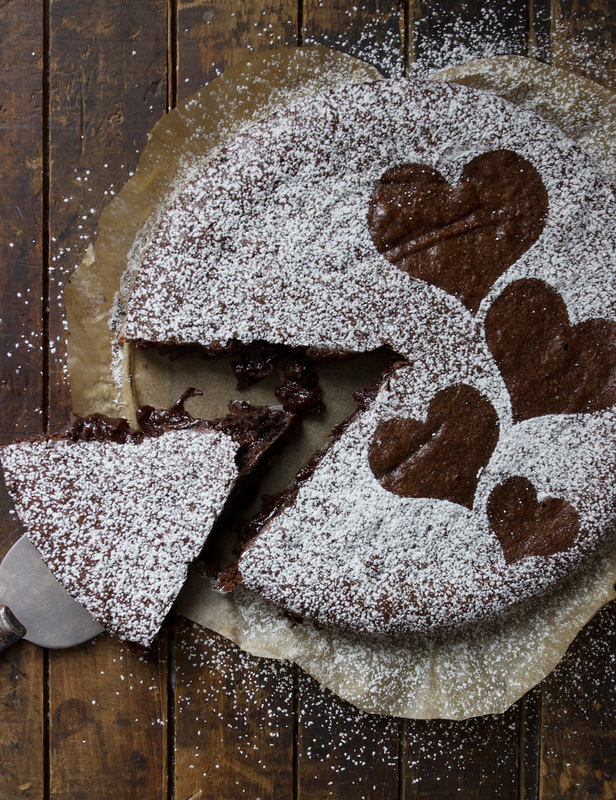 I mean, what could be more perfect for Valentine’s than a chocolate cake with goey in the title?! So I made it. And I photographed it. Still warm from the oven. And as soon as I took the last photo, I ate the rest of that piece you see in the photo. And then I ate another one, because I really had to make sure it was as insanely delicious as I was thinking it was ;) And yes. Yes it was. 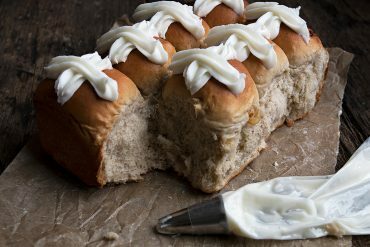 1) It is made with super basic pantry items (read … can be made any time!). 2) It is made with just a bowl and a whisk (no mixers required!). 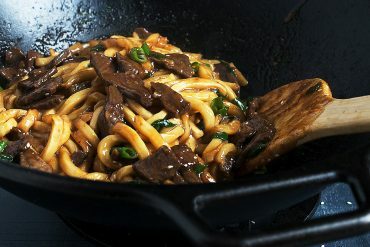 3) It is ready to eat in less than 30 minutes (start to first warm, goey bite!). The recipe calls for cake flour. If you don’t have cake flour, all purpose can be used. I always have cake flour around, since I’m a baker, so I have’t tested this cake with all-purpose. I suspect it will change the texture only slightly, but not in any way that will dampen the warm goey experience. You could also try making your own cake flour, if you like. Simply measure out 1 cup of all-purpose flour. Remove 2 Tbsp. and replace it with 2 Tbsp. of cornstarch. Sift together and use in the recipe below. 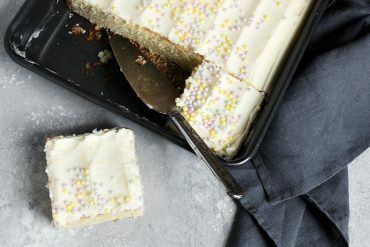 You owe it to yourself to enjoy this cake warm from the oven, but be assured that left-overs are also lovely. The cake will become a little less gooey with re-heating though. I didn’t feel like this cake needed anything else with it, though a bit of ice cream or a dollop of whipped cream would never be a bad idea. To make the heart decorations, I printed a heart template out (the internet is full of them! ), cut them out and arranged them on top of the cake before dusting with icing sugar. Carefully lift of and discard to reveal a pretty heart pattern. 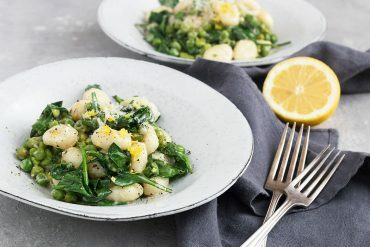 Quick, easy and goey delicious. Enjoy warm from the oven, at room temperature or chilled. * You can substitute all-purpose flour. It will affect the texture of the cake just slightly. You can also make your own cake flour by replacing 2 Tbsp. from 1 cup of all-purpose flour with cornstarch. Sift together and use in recipe. Line the bottom of a 9-inch springform pan with parchment paper. Brush parchment and sides with butter and dust with a bit of cocoa, discarding any excess. In a medium bowl, whisk the 10 tablespoons of melted butter with the sugar, cocoa powder, vanilla, and salt until well mixed. Add the eggs one at a time and whisk until smooth. Fold the flour in to the batter until just until it is combined, then scrape the batter into the prepared pan, smoothing the top. Bake until the cake forms a thin skin on top but the batter is still loose in the centre, about 10 minutes. Let stand a few minutes, then run a knife around the outside and loosen and remove ring. Slice and enjoy. Left-overs can be refrigerated. Hi Jennifer. 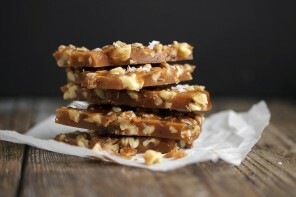 I love this recipe, and it’s very handy when travelling with a limited pantry available. I recently made it while staying in a vacation rental house with very limited cookware. The options were cookie sheet or loaf pan. I chose loaf pan, added a few chopped toasted pecans and added a few minutes to the given time to get to the same semi-firm state. The result was delicious, I think as good as in the intended pan. Thanks for the recipe, it’s in regular use here in whatever bakeware is available! Wow! I can’t get over how wickedly ooey & gooey that center is. It looks completely irresistible and, frankly, I don’t know how you even made it through the photoshoot without eating the entire thing. I don’t think I would’ve been able to pull that off. Oh. . .and I’m definitely going to have to dig up that Saveur 100 list. My goodness, this is delectable! 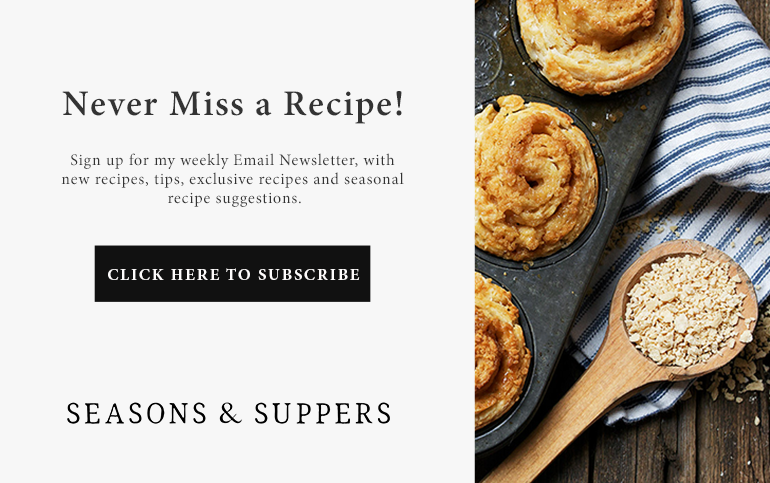 You certainly saved the recipe for the perfect event! And I’m so glad you did! I agree – this needs nothing else! Perfetto! 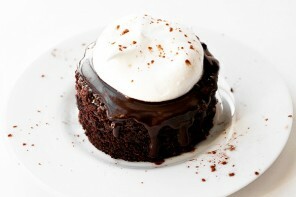 Oh my, warm chocolate cake sounds so decadent and wonderful. Love the photography. It is a show-stopper and the subtleness of the sugar hearts keeping that gooey chocolate company makes me smile from ear to ear. Thanks so much, Cindy :) I had a lot of fun cutting out these hearts. Took me back to when my kids were little! This is dangerous Jennifer! Almost too pretty for words, super easy and insanely delicious. I’m ready to crank up the oven! It is all that, Chris (including the dangerous ;), but that said, chocolate therapy is a thing in my world, so I’m going to love having this one in my back pocket! Goodness! I can see why you couldn’t stop eating this. It’s so pretty and you just can’t go wrong with gooey chocolate! Thanks so much, Tamara and so lovely to a virtually meet you, too! Happy Valentine’s! Now it’s on my list for 2017! I can see why you dug right into it…. I know I would have done the same. Just gorgeous! Goodness, Jennifer, this cake is just gorgeous! 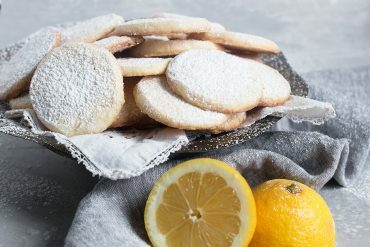 I love the hearts on top with the powdered sugar!! I seriously can’t believe this beauty is so quick and easy to make! Boy will go craaaazy for this chocolaty deliciousness! Pinned! Cheers! Wow – this is absolute perfection. So simple, just so delicious. 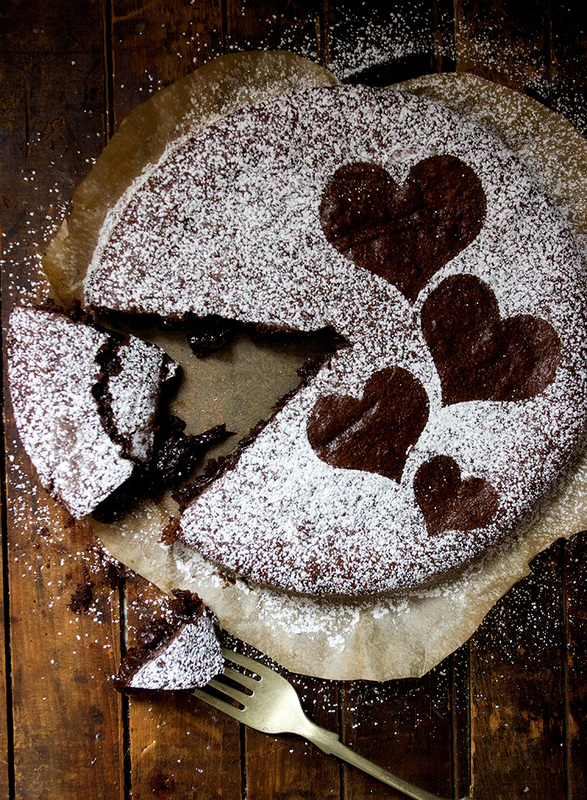 Your powdered sugar design is so beautiful, just enough for Valentine’s Day, if you ask me. I don’t need lots of pink and red, give me simple chocolate any day. Pinning and sharing! Thanks so much, Tricia and yes, the way to my heart is definitely goey chocolate, too! i would be do the exact same thing Jennifer! one slice of this warm, gooey chocolate cake would definitely not be enough. can’t wait to give this recipe a try! Thanks Cathy :) I highly recommend this cake for chocolate therapy at any time! It definitely is important to taste test ;) Love that this comes together in 30 minutes! I need to make this, like, now! The hearts on the top are just too cute! Pinned! Happy Valentine’s Day! Oh, I’ll definitely NEED to try this one Jennifer, without a doubt! 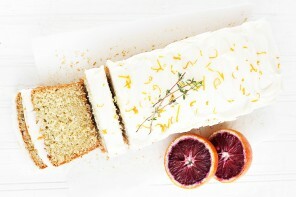 I’d have to photograph this one on a full stomach too or I’d never get through the shoot! The perils of being a food blogger! My Valentine would LOVE this! 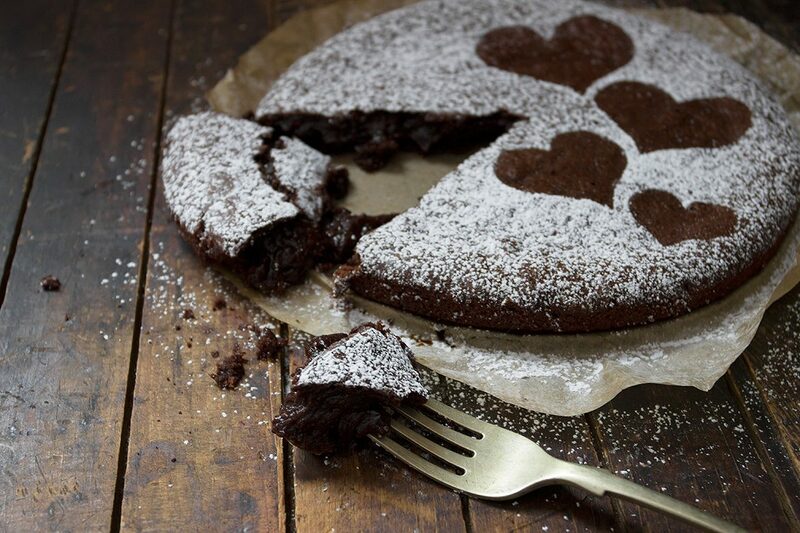 Warm, gooey chocolate cake? Oh my yes. It looks divine and I can only imagine how good it tastes. So happy to be in this virtual Valentine’s Day party with you! Cheers! Thanks so much, Karen and cheers to you, as well!